Organic coconut oil is a wonderful 100% natural skin food for all skin types. It is an effective all over body moisturiser, absorbing very readily into the skin and keeping it soft, but not greasy. 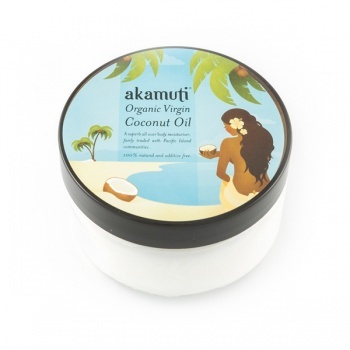 Perfect for all over moisturising, coconut is the ideal choice for maintaining strong, healthy skin. We recommend applying it after a warm shower while the skin is still warm. Watch your skin drink it in! Coconut oil helps to rehydrate dry, hungry and undernourished skin. Ideal for everyday skin maintenance, coconut oil is easily absorbed through the skin, giving it a soft, smooth texture. This beautiful organic coconut oil is fairly traded with Indonesian island communities throughout the Pacific Ocean. All the oil comes from family farms only, where individual families work together to collect and process small amounts of coconuts on a daily basis. An integral part of tropical island life, coconut production forms a pivotal role in the lives of coastal communities, of which many are now endangered. By purchasing this organic coconut oil we support not only the livelihoods of island communities, but their language and cultures, their forests and reefs.